As you know, Lil Man and I love books. And we've recently added a new one to our collection. It's called Bosley Goes to the Beach, and it's by Timothy Johnson from theLanguageBear.com. These books are designed to teach young children new words in various languages. We chose the English-Spanish version. But there are several options to choose from such as Spanish, French, Italian, German, Russian and Japanese. I really enjoyed the story. 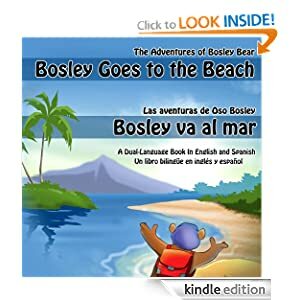 It's about a bear named Bosley and his adventure at the beach. The story was well written and easy to follow. And the illustrations were excellent. We were reading the Kindle version, and I liked how some of the key words were different colors which made it easy to point out in both languages. I would definitely recommend this book to friends. In fact, I couldn't mind having the entire series. And because of that, I'm giving away a copy to one of my readers. One lucky winner will receive either a print or digital copy of their choice. Enter to win. Good luck. The giveaway is from July 10- July 15. Full Disclosure: theLanguageBear provided me with a free copy of the book for the purpose of providing a review. My opinions are completely my own based on my experience.